Discover the ground-breaking solution to business analysis interview questions. Plan your entire interview ahead of time; learn proven ways to answer business analysis, skills based and situation-based/behavioural questions along with the interview strategies and helpful tips. This book is cut-and-dried for Business Analysts, preparing for an interview, who, either may already be recognized professionals within the industry or are potential applicants looking for a breakthrough. 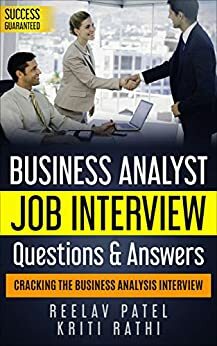 It was after extensive research on the job market and surveying Business Analyst interview questions among the top Fortune 500 companies, the authors decided to put together ‘the highly expected’ job interview questions and shared many of their skills, experiences and undertakings in the form of sample answers, all enclosed in this book, now unleashed, for you to succeed! Need help cracking situational/scenario-based questions? What strategies to employ to make your answers stand-out, smartly? Any last-minute hacks to let your personality shine through equally well as your answers? All this and more…. right in this book, to flourish! Keto Bread: The Ultimate Low-Carb Cookbook with a Mouthwatering Collection of Quick and Easy to Follow, Delicious Ketogenic Bakery Recipes to Intensify Weight Loss, Fat Burning, and Healthy Living! 5.0 out of 5 starsThis is an excellent book! It talks about everything you need to know to perform very well in a job interview. I am going to start looking for a job next week, and with this book, I feel pretty confident about going to the interviews when they call me. It's not easy, you still have to practice, be confident and prepare yourself before. But this book sure helps a lot during that process. One thing I really liked about the book is that it shows you what are the most common questions that they'll probably ask you in every interview, and also gives you an example of how you can answer those questions in order to give a very good impression to the employer. There are situations, business analysis questions, questions tips and pretty much everything but no domain questions included. I understand that it is not possible to add all the domains in one book, but it would be great if someone can come up with only domain-based questions in a single book. 5.0 out of 5 starsVery helpful and insightful. Finally a book that has the thorough interview process explained simply and tells you what questions may be asked and how to prepare for it. I spent countless hours on the internet researching how to answer interview questions with conflicting advice. With this book, it is in one place with examples divided between people with work experience and those who have not held jobs previously. Very helpful and insightful. I think this is such a major help to go with a meeting for Business Analysis position. Contains every single plausible inquiry which may ask amid the meeting. Tips and test answers are for the most part incredible and truly influence you to accomplish the passing evaluation. As I read the inquiries, I felt that I am the person who truly do the meeting and got an exceptionally decent reaction. Extraordinary and valuable manual.